It was 0 C (32 F - freezing point) at 9:30 this morning when I left home on my bike. Slightly misty, but no snow on the ground. On the way to the usual huneliggers meeting place the cycle paths were all clear of ice and well used by people cycling to church as well as other cyclists going about their business. We rode out into the countryside, along many rural bike paths, cracked ice with our tyres on the rough recreational paths which are beyond the reach of the gritters, stopping for lunch on the way next to frozen picnic benches than no-one dared sit on. A couple of sandwiches and a gulp of icy water from a bottle and we were away again to cover more ground. We rode past frozen lakes, through forest, collected a bit of mud on our wheels and saw mountain bikers, hikers and horse riders also out enjoying the cold and mostly silent day. On the way back home we picked up some speed. For the last 20 km it started to snow lightly, reducing the temperature from the peak of nearly 2 degrees above freezing. Just before pulling back into our road my bike computer ticked over 95 km. Another wonderful ride. Shopping trips may seem mundane, but they are a type of journey that makes up a large percentage of the total that most people make. Everyone needs to eat. Enabling shopping trips to be easy by bicycle is as important as enabling trips to school or work. This is a journey made on a perfectly normal bicycle by a person wearing normal clothes. It's about 2 km in each direction to get to the shop shown, though I have a choice of two other shops which are closer than that. The video is cut to make it more varied and take out repetitive parts, and I take a different route home in order to show some variety. However it still accurately portrays what a journey of this length is like. You see very few cars as they take other routes. Talking of which, if I was to drive I'd have to stop at two sets of traffic lights to get to that supermarket, and while the parking is free at the supermarket it is further away from the front door of the shop than I can park my bike. It's almost always quicker by bike than by car. In the video you will see the "lonely bicycle" which is parked at a bus stop around the corner every day, and one of the underpasses which allows cyclists to avoid traffic lights. There is also a stretch of outdated cycle lane which is soon to be replaced along with a section of what I expect to replace it, we get to completely avoid a roundabout twice, we have priority when crossing roads twice, ride on residential streets which are empty of moving cars because they provide permeability only for bicycles and collect our shopping without using any carrier bags because it can be transferred directly from the supermarket trolley into the bike baskets. We also see lots of other people doing the same thing, because there are always lots of other people cycling everywhere. This was actually a slow day at the shops. On busier days I can't get my bike indoors at the shopping centre because there isn't room. Want to see it for yourself ? Come and visit. My youngest daughter was stopped by the police this morning. She set off with working lights, but half way to school when she passed the bike light patrol they were not working. She was stopped and given a €10 fine to pay. Here is proof that once-upon-a-time she must have had working lights. Her bike, like all the children's bikes, was inspected by the police at primary school last year. The sticker was given for bikes which passed all the tests, including having working lights. In this case, the dynamo seems to have packed up altogether and of course I get to fix it. At least I have some emergency bike lights that she can carry in future. I've had a spate of punctures recently. First of all the rear tyre on my recumbent punctured on a recent ride. I got another puncture on Saturday night on my town bike. A very sharp piece of pointed stone had gone right through the tyre. In winter and in the wet, bike tyres are very much more prone to punctures. In the past I've tried every type of anti-puncture device. Nearly 20 years ago I tried "greentyres." These are solid (or microcellular as they like to describe them) bike tyres which were extremely difficult to get onto the rims and resulted in a harsh and slow ride and broken spokes. They were enough to make me realise why pneumatic tyres are such a good idea. I tried Mr Tuffy strips which did prevent punctures for a while, but the sharp edge slowly made a long cut around the entire circumference of the tyre, which caused a completely non-fixable puncture. The idea of a barrier is good, though, and there are better products. I found the Panaracer Flat-away strips to work very well. These are not made of hard material, but a sort of kevlar "cotton wool", so they don't damage the inner tube. I had one of these left in the cupboard full of bike bits and it has gone into the town bike front tyre. The recumbent is another story. I've been running a worn Tioga Comp Pool tyre on the back. That's a good fast tyre in the summer, but is too hard a rubber compound for grip in the winter and it's not terribly puncture proof either. I am switching back to the reliable Vredestein tyres that I mostly have used before. I had extremely good luck with the Vredestein Monte Carlo, having never had any punctures at all with those tyres (I've had flats, but only due to faulty tubes) even though I've got through several sets and even when I've worn them down to almost nothing at all. So, for my PDQ I'll be looking out for another Monte Carlo, or the new replacement, the Vredestein Perfect Moiree. Since writing this text, I've found that even the Vredestein Perfect Moiree is vulnerable to the small sharp stones which seem to be so common around here. The ultimate puncture resistant tyre, with which I've not had a puncture at all, would seem to be the Schwalbe Marathon Plus. These short films promote the OV-Fiets, a shared bike scheme which is aimed primarily at helping users of public transport get to and from the station and which is present at many locations in the Netherlands. OV-Fietswoman rescues a stolen bike. For a friend as well as for yourself (note that you can promote cycling here by showing people riding a bike while eating an ice-cream and with someone sitting on the rack). 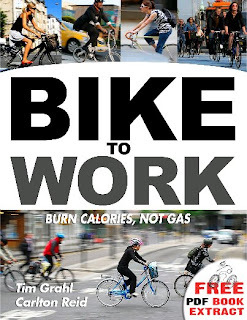 Gain freedom by hiring a bike. There are only around 5000 OV-Fietsen at the moment, but numbers are growing rapidly. More facts and figures about bicycles used with trains can be found here. The films were made by Nieuw en Verbeterd ("New and Improved"), a film making company. I found them via the Fietsersbond blog. There are other posts about Integrated Transport. In the East of Assen there is an underpass which dates to the 1960s which goes under the railway track and a road. There are several underpasses in the city for cyclists and pedestrians - this is the only one which accommodates cars as well. The cycle paths are narrow by modern standards at only 2.5 m wide for a bidirectional path, but other features of this underpass are rather good. It separates cyclists from pedestrians as well as from motor vehicles. The tunnel goes deeper for motor vehicles than for cyclists because motor vehicles (e.g. trucks) can be taller than bikes. This means that cyclists don't have to go so deep and so the gradient to climb at the other side is easier. The path is bidirectional on both sides of the road, meaning that for a lot of journeys cyclists don't need to cross the road at all. There are other posts about cycle only underpasses. This evening I cycled out to meet my 12 year old daughter on her return from a friend's birthday. party. On the way I came across a gritter lorry on the cycle path and it reminded me that I'd not yet blogged about what happens to ice on cycle paths in the winter. Last year in early November there was an article in the local paper telling us that the cycle paths would be gritted and salted regularly through the winter. My reaction was disbelief. I thought it would never happen. However three days after the article it was Sunday and I went for a ride around Assen. On the way virtually every surface I cycled on had evidence that the gritters had done their job. No ice. And so it was right through the winter. No ice at all on the cycle paths. The same seems to be happening this year. The picture shows the published gritter routes for last year (I've not seen if there are any changes this year). According to the information distributed last year, the council owns six gritting machines for roads which cover 340 km of road in the city each day and four cycle path sized gritting machines for cycle paths which cover 207 km of cycle path each day. These figures initially seem odd as the city claims to have 390 km of road, but just 108 km of segregated cycle path. 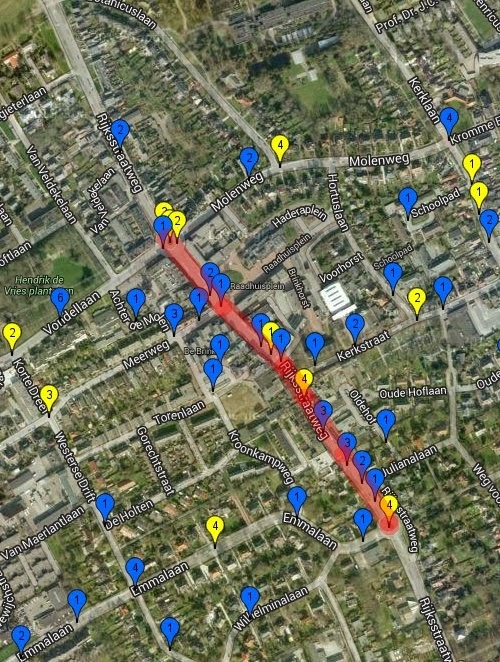 The discrepancy is explained because the cycle path figure covers roads only once where the path is on both sides (as it frequently is), and doesn't include roughly surfaced paths or the few on road cycle lanes, nor the commuter routes from outlying villages which are shown on the map in the picture. Maintenance of cycle paths is important. Not only are they de-iced in the winter, but they are regularly swept all year around and faults are fixed quickly. There is a regular programme of improvement. Cycle paths can't be allowed to fall into disrepair or to become unusable due to ice as that would be a dis-incentive to cycle. These paths are essential infrastructure in a city where people each make an average of nearly 1.2 journeys per day by bike. There is another blog post showing photos of people riding in the snow. 6/1/2009 update: I've realised that "gritting" means different things to people in different places. Over here what is used is salt. While last year this seemed to be NaCl / Table salt and played havoc with anything that could corrode on the bike it seems this year it is something else. I understand there is an ammonia compound which can be used which becomes fertilizer. I use the term "gritting" as that is what would be used in the UK, where sometimes grit a little larger than sand is also used. It seems from reading some of the American blogs that they use rather larger stones there which make cycling very difficult. I don't think that would be acceptable here. Do you like cycling in winter ? We do. Relatively short hops between warm cafes can be very pleasant in the winter. We're organising a winter warmer cycle ride in January. 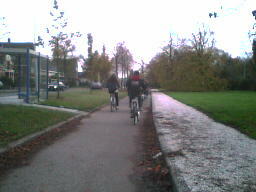 We expect the cycle paths to be free of ice and safe to cycle on. The ANWB is the Dutch equivalent of the Automobile Association. They campaign for motorists rights, they offer car insurance, produce route maps and have a car rescue service should your car break down. However, there is another of those history twists here which sets the Netherlands apart from many countries. The letters A.N.W.B. actually stand for Algemene Nederlandsche Wielrijders-Bond, or in English: General Dutch Cyclists Union. So, even the car driver's organisation here is also a cycling organisation, and they do things like cycling maps, cycle rescue, putting up signs for cyclists as well as those things for drivers (they don't necessarily do these things as well as many cyclists might like, mind you, which is why the Fietsersbond was formed in the 1970s to provide an alternative for cyclists). Anyway, to get back to the reason for this post, the ANWB produces a weekly newspaper which is free in many shops. I noticed this week that they're giving away free bike lights, which might be of interest to my Dutch readers. They're not the only ones offering free lights as the nights get darker. I also have a few pairs of emergency bike lights which are free with a bicycle basket if you mention them at the time of ordering (I only have a few pairs, though). 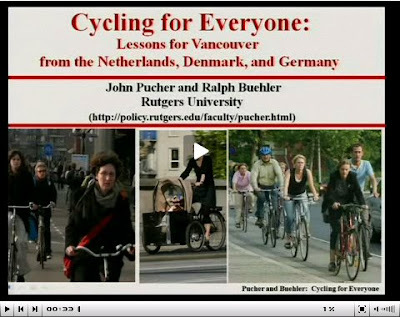 The presentation here was made by John Pucher, Professor of Planning and Public Policy, in Vancouver. John is one of very few English speaking cycling experts who has really understood what is involved in achieving a mass cycling culture. He and Ralph Buehler also wrote the invaluable article How cycling was made "Irresistable" in the Netherlands, Denmark & Germany. I previously posted about how everyone cycles. The Netherlands has a lot of bicycles, and as a result also a lot of cycle theft. However, most theft is in the bigger cities. 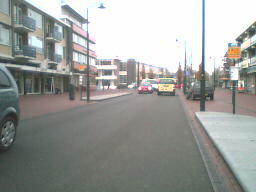 Assen is a very safe place to park your bicycle. The insurance companies know about this stuff, and cycle insurance costs half as much here as in Amsterdam. Here, you'll find that people are generally quite happy to leave their bikes secured just by the inbuilt lock which prevents the rear wheel from turning. They will leave what they've bought from one shop on their bike while they visit another, that removable lights / panniers / bike computers etc. are left on the bike and don't go missing. While there are very many cycle racks, there is never enough formal bicycle parking. What's more, even though the racks are outside virtually every shop, people often want to park their bikes even closer to their destination than the bike racks. As a result, on busy days (which means pretty much every day except Sunday) there tend to be as many bikes parked "wild" as in racks. There are no cars on any of the streets shown here, so there is plenty of room for bicycles and a relaxed atmosphere for cycling. It wasn't always like this. The city centre was once dominated by motor vehicles. However, changes were made in the late 1970s / early 1980s to exclude cars from the city centre and the result is the vibrant city you see today. We've many types of cycle parking here, and the most popular racks are those which support the bike by the front wheel. The problems with the inverted U shape "Sheffield" type racks is that they don't stop the bike from falling over, they don't allow bikes to be parked very densely (which is important when there are a lot of bikes) and they get in the way of one side of the bike. For people trying to pack large panniers on both sides with shopping they don't work very well while racks which support the front wheel do. I'm not talking about "wheel benders," but racks which support a greater part of the radius of the wheel and actually work. When they also have a loop through which you can put a cable then the frame can be secured as well. Not that many people bother here. Finally a view of a different kind of bicycle parking. There is a beach right on the edge of the city. We're quite a way from the coast, so it is a lake surrounded by trees. I took this photo on a hot day in May this year. The cycle parking stands at the beach were of course overflowing, and many bikes were parked in with the trees instead. Previously I've shown the cycle parking at Assen railway station as well as in Groningen. Marc at Amsterdamize also covered cycle parking today. Or click for many more cycle parking examples. Assen is a great place for a cycling holiday. Bring your swimming gear too. The Netherlands in general is very safe for people too. Sinterklaas is a nice man with a red coat and a white beard who likes to give presents to good children in December. I suspect that my English speaking readers are with me so far, but the story departs from what you're probably used to. Sinterklaas lives in Spain and travels by steamboat and on a white horse to places where the boat can't reach. He gives presents to children on his birthday, the 5th of December. Our local paper told us a few days ago that when the Burgemeester (mayor) of Assen was in Spain this year to organise the dates for the Vuelta a Espana, he just happened to bump into Sinterklaas and mention that for the first time in 40 years it is possible to sail right into the centre of the city. Sinterklaas naturally was keen to try this out. Today Sinterklaas arrived in Assen on his steamboat. There was much excitement, mainly amongst Assen's younger citizens, but also amongst their parents and grandparents. Of course, there is only one way to get to a large event here, and that is to cycle. You'll see in the video how even a five metre wide bicycle road can't cope with the number of bikes when Sinterklaas visits. There's a website about the Sinterklaasintocht in Assen. These days, the Kerstman (Christmas Man) also tends to visit on the evening of December 24th. However, there is campaign to encourage people not to put up Christmas trees, nor other associated things at least until December 6th. Our local paper has revealed the route of the first stage of next year's Vuelta a Espana (the cycle racing tour of Spain). The Vuelta has only once before started outside Spain: in 1997 the start was in Lisbon in Portugal. However, the chosen starting place next year is right here in Assen. On the 29th the riders will start with a prologue on Assen's motorbike TT circuit. On the 30th they'll race the first stage, 201 km long through Drenthe. 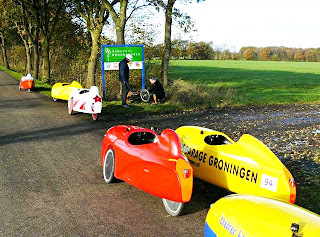 The start will be in Assen the route goes south to Hoogeveen turning North East and returning to Assen from the East through Grolloo and Rolde, then North as far as Groningen Eelde airport and back south to Assen, before going South East again to end the day at Emmen. It's quite a ride. The route will no doubt be planned to take in some of the Paris-Roubaix style pave we've got hidden in the countryside here. Addy Engels, a local rider who has raced in the Giro d'Italia six times, the Vuelta four times and the Tour de France once is hoping to win the stage on his home soil in Drenthe next year. I wish him the best of luck. Dutch riders have twice won the Vuelta overall. There is also to be a touring version of the Vuelta in Drenthe. Further details will follow. I must have mentioned before that cycle racing is popular in this part of the world ? I may even be tempted out to have another go myself. There's a later post showing a map of the route. Over the last few years there has been much buzz in the press outside this country about Shared Space. This is the idea that if you get rid of separation between different modes of transport that everyone will be forced to interact on a more human level and a reduction of accidents will result. It shows a remarkable faith in human nature to expect this to happen, and I'm sure we'd all like it to be true. But is it true, or is this just a case of The Emperor's New Clothes ? Shared Space - Does the cyclist fit in that gap ? The idea started over here in the Netherlands with Hans Monderman, who achieved some fame with these ideas before his untimely death earlier this year. I am sure that his intentions were entirely good, but having lived with the results of this type of planning for a while now, I think it is time to cut through the hype that even Hans acknowledged surrounded his work. There are quite a few Shared Space influenced areas near where we now live. These photos were taken in Haren, a suburb of Groningen about 25 km north of Assen. 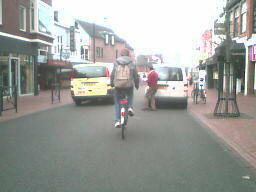 The centre of Haren is very busy and cyclists really need to look out there. By Dutch standards, I find it not a very pleasant place to cycle. It's the only place that I've had to do an emergency stop in this country to avoid a crash and if the Shared Space part of the town was any more than a few hundred metres long, I think I'd take another route to completely avoid it. Take a look at the photos that I took on the way through. There are cyclists being pursued by a taxi, another who has been overtaken as he pulled out to get around a parked car, a pedestrian at the side of the road who is having trouble getting a chance to cross, and, well, cars, cars and more cars. Some of them blocking the pavement. At least the speed limit is just 30 km/h, and Dutch drivers seem more aware of their responsibilities towards vulnerable road users than some of those elsewhere. 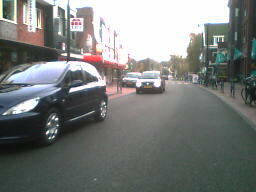 Shared Space - cars, cars, cars. It's not for bikes. I am far from the only person to see Shared Space in this way. If you watch this video about Haren you will see a comment by youtube user "dgoedkoop" which reads "Heel wijs om alleen op de winkeliers in te gaan, en niet op de weggebruikers. Want de fietsers zijn er zeker niet blij mee, dat de fietspaden zijn weggehaald! Dat lijkt sowieso het grote nadeel van Shared Space, want in het filmpje uit Drachten kwam ook al naar voren dat er 'slechts' enkele ongelukken met fietsers waren gebeurd." This translates as "It looks like what the shop-keepers wanted, not the road users. Cyclists certainly are not happy that the cycle paths have been removed. 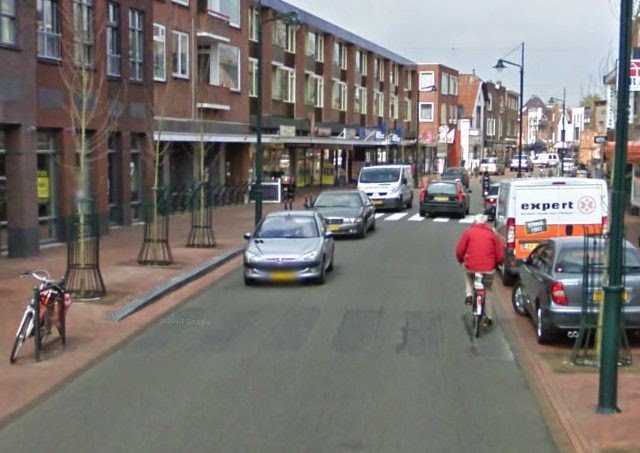 It looks like the great problem with Shared Space, as seen in the video from Drachten, is that 'just a few' crashes between cars and cyclists have been caused." That is far from the only criticism. The link above about "hype" includes a quote starting "Ik woon zelf in Haren..."
This translates as "I live in Haren where Mr Monderman has convinced the local government that his philosophy is best. 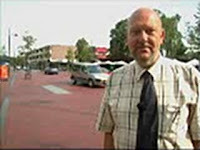 Now, many residents of Haren find the situation has become less safe. It is true that more accidents have not resulted, but the subjective safety has got worse. People feel less safe in the new situation. I think that many more near-accidents occur." "According to Monderman, pedestrians and drivers have to be friendlier and to look out for one another, and then zebra crossings and suchlike are not needed. It doesn't work in practice. At the insistence of many organisations (parents organisations, Fietsersbond (the cyclists union), several zebra crossings have been laid." In general, cyclists do not like it. 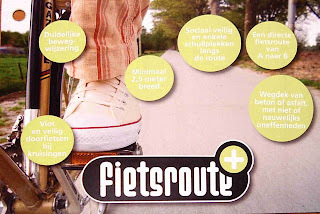 Fietsersbond has objected a few times, including in an article in the November 2007 issue of their newsletter "Vogelvrije Fietser" (that's where the cartoon comes from). This acknowledges that Monderman had become a hero outside the country, but also includes many negative comments from cyclists in the Netherlands. There are comments from cyclists who are interviewed in which they say that they have to look out much more and that they don't like it. That it has lead to an atmosphere of "might is right" in which some cyclists come off worse, and that it makes people less happy to cycle. It should be noted that while there are more Shared Space areas here than elsewhere, they are still comparatively rare in this country. There are around 100 areas designed in this way, mostly just single junctions in the centres of villages and small towns. Segregated cycle paths continue to join these places together, and in most cases the majority of the infrastructure is still designed on traditional, successful, Dutch lines with a high degree of segregation of cyclists. If you've heard of Dutch infrastructure increasing the number of cyclists, that is where to look as that is what 99% of the infrastructure looks like. The majority of the infrastructure is designed to avoid conflict in line with sustainable safety principles which have lead to an improvement in safety in the Netherlands. even though it's not allowed. Not good for pedestrians. To me, Shared Space is at its most successful in small villages of just a couple of hundred homes which already had little traffic and where there is really not much of a problem to start with. In bigger places, it can be quite unpleasant. out that drivers don't "share" with people crossing the road. the need to ride far to the right in "the door zone"
One of the reasons why the Dutch have had such success with controlling traffic is that they try things out. Shared space is but one of a series of brave experiments. I am sure that the better aspects of it will continue to appear in new infrastructure, but the less successful aspects will be left behind. I note that a recent road layout change in Assen right next to a "shared space" style junction from a few years ago did not expand on the shared space but represents a return to more traditional Dutch design with segregated cycle paths. I am glad about this. It would be foolish to abandon the high level of subjective safety that has lead to such a high degree of cycling. It would take years to build enough cycle unfriendly infrastructure to really impact on the level of cycling, but once the decline started it would carry on for decades. For me, cycling in places like this is the closest I come in this country to the conditions in cycle unfriendly towns of the UK where cycling is a fringe activity. 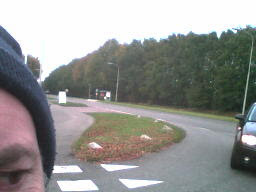 I find I am happy to be out of it and back on the normal Dutch provision as shown here further along in Haren. In my view, Shared Space is the one real mistake that has been made in the Netherlands. It's not liked by cyclists, and it really doesn't work well for cyclists. This one includes a response from a Haren resident which says "Citizens club Haren for elderly and children is very much against the shared space in our village Haren. The results during last elections prove this by a unknown shift in elections results. So, beware! As father of two small kids and for my elderly parrent i'm just afraid because of many, many small unregistred accidents of people bumping into each other. We fully disagree with the public statement that we should let our kids run in front off cars to slow down traffic! Just mad and our web campaign won't stop." This academic paper includes the following in its conclusion: "...there still are noticeable conflicts, and this leads to criticisms by engaged parties, both car drivers and ‘sojourners’. They do not feel safe. In fact pedestrians and bicyclists run more risk than car drivers. The mobility of children, people with handicaps and the elderly is limited; children are not allowed to freely walk around independently; the handicapped and the elderly feel themselves cornered and obliged to use the area as little as possible. They pay the toll." This one (from the guide dog organisation in the UK) includes this section from people who live in shared space areas: "All of the participants reported greater difficulty using shared surface areas than areas where there is a pavement separated from the road. Several participants considered that most vehicle drivers reduced their speed in shared surface areas and that most vehicle drivers and cyclists were considerate of pedestrians using shared surfaces. However one participant commented that '9 out of 10 cars would stop for me. My difficulty is recognising the 10th'. Use of shared surface areas. All except one of the participants regularly used local shared surface areas alone, without a sighted companion, but found this difficult. One participant commented that: 'We have to use these areas or we will lose our independence'. One participant, older than the others, reported that he no longer used shared surface areas unless he was with a sighted companion." Some newer blog posts show very much better alternatives to Shared Space. in the shared space. "Is it safe here ?" We visit Haren regularly as part of our Study Tours. On the May 2012 tour, entirely by chance, we visited at the same time as a local school was doing a project in the Shared Space. Some students were noting how often drivers gave priority to cyclists when the cyclist had priority (this is a huge problem in shared space areas as drivers tend to assume priority through force). Other students were interviewing people. I filled in a questionnaire which had questions which included whether you felt safe in Haren in general, whether you felt safe in the Shared Space area, and whether you avoided visiting Haren because of the Shared Space. There is only one reason why this work was being done specifically about Shared Space, and that is because it remains controversial and unpopular in the Netherlands, even though some "experts" still promote it. It was quite clear from listening to the responses given by other people that it's not popular. Whenever it is pointed out that Shared Space doesn't work, someone is guaranteed to pop up and claim that whatever example is being pointed at isn't a proper "Shared Space". This is an example of the No True Scotsman fallacy. An "attempt to retain an unreasoned assertion". It doesn't work with Shared Space because Hans Monderman himself is on record as saying that Haren's Shared Space is a good example. You can see this for yourself in a video of him talking about Haren. 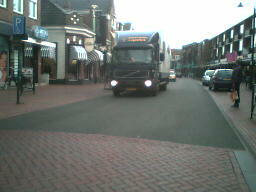 Shared Space is one of a number of things which are misinterpreted from the Netherlands. Please read another blog post which explains how while the Netherlands is still the leader in cycling, that doesn't mean that everything from that country is equally worth copying. If "Shared Space" does not work, then what does work ? Confident cyclists use all of a "nearly car free" street. It is not "Shared Space" because cars are excluded. "Shared Space" receives a lot of attention overseas despite having fallen out of favour in the Netherlands. It's not popular here and most town centres do not work on a "Shared Space" basis at all. They are not "shared". 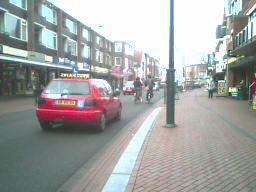 "Nearly Car Free" or "Autoluwe" streets are very common in the Netherlands and very popular. To the uninitiated, such streets can look like "Shared Space" and it is common for these two concepts to be confused by overseas commentators. However, NCF is a concept which pre-dates the hype about "Shared Space", which remains popular, and which works precisely because the streets are not shared on an equal basis with cars. Read more about Nearly Car Free streets. There has been much speculation about whether Haren's shared space is safe. Shared Space advocates claim that there's been a reduction in collisions while those who dislike the Shared Space point out that incidents are common. I now have figures. Between 2007 and 2012, there were 28 collisions and at least five injuries in the shared space are of Haren. As you'll see from the map on the right, the busy road leading to the shared space from the south east and away again towards the north west does not have the same rate of collisions or injuries as does the short shared space section. In about the same length of road outside the Shared Space there was just one collision and this resulted in no injuries. Read more about how the supposed safety of shared space has been exaggerated. There are also now several other blog posts about shared space. One shows the considerably better environment which resulted from removing motorised traffic from a shared space while another demonstrates how shared space takes away the rights of the vulnerable. Both of those are illustrated with video. All posts on this blog about Shared Space can be viewed by clicking here. It is good that people should see for themselves what these schemes look like, and particularly cycle through them. We cycle right through Haren on our Cycling Study Tours. We also show you good examples of what works, including nearly car free streets. "Long Shall She Live" - traditional Dutch birthday song. My eldest daughter is fifteen today. Happy Birthday ! She set off for school on her bike this morning, as every morning, and she'll be accompanied home by several friends on their bikes this evening for cake and so-on. Some of them live between 10 and 20 km away, but they'll ride home on their own afterwards (some will have up to 20 km to go). They're all getting a good head-start towards the 100000 miles that many will cycle in their lifetime. Fifteen is still very young. You can't buy beer here until you're sixteen and can't drive until you're eighteen. The Netherlands is a great place to be a child, largely because children her have so much freedom due to parents being happy to let their children cycle more or less as far as they want, wherever they want and when they want. The photo, added later, shows some of the bikes. I make those bike baskets. 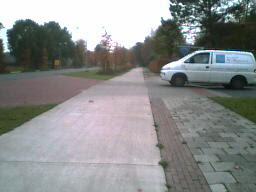 On the North side of the Vaart in Assen is a bicycle road which has no traffic lights on it all the way into the centre of the city. That's the primary route in this direction. Today we're on the Southern side of the same canal, on a secondary cycling route, which has this one set of traffic lights for cyclists. There are a number of interesting things here. The parallelogram features on the ground are the second set of detectors for bicycles which you roll over on the way to this light. The first set is about 50 metres before the lights. It is advantageous to cyclists to have their own detectors as they are never set up so that they only detect cars. Having the double set means that often the lights have changed for you before you reach them. There is also a yellow button on a post which allows a cyclist to make sure that the traffic light controller is aware of their presence. If the detectors should fail, then this gives another way of indicating the presence of a cyclist. Next we have the green sign on the traffic light post, which indicates this is a simultaneous green junction at which cyclists can go in any direction they want (left, right, straight on, diagonal) when there is a green light. All motorised traffic is at a standstill while this happens. Cyclists are never given a green to cycle straight on while drivers have a green to turn right. To do this would put cyclists into the most dangerous and lethal position on the road. This is why we do not have junctions designed in the same way as in Denmark. Also note that you can see lamps on the lampposts ahead over the cycle path as well as over the road. 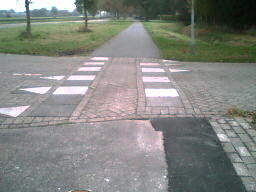 This helps to improve the social safety of this cycle path at night. Finally, note the width of the cycle path. It's over 3 metres in width, even though it's merely a secondary route paralleled by the 5 metre wide bicycle road on the other side of the canal. This is proper cycling infrastructure which attracts cyclists, designed for a high degree of actual and subjective safety. It is part of what has resulted in Assen having 41% of all journeys by bicycle - a higher cycle modal share than can be claimed anywhere outside the Netherlands.